Are you using Final Cut and Motion for your productions? 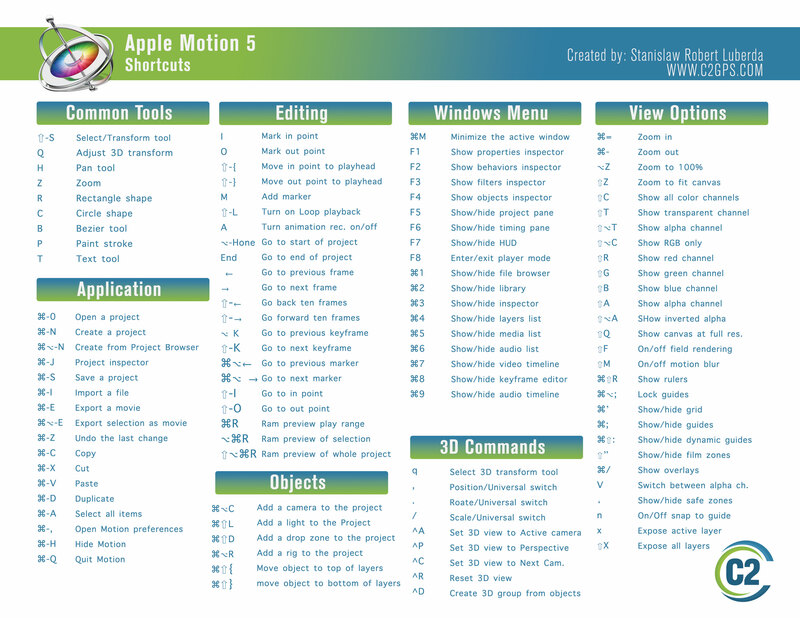 If you are new to Motion, it’s an extremely economical solution for motion graphics if you are working on Mac. In fact I would wager there’s a lot of things you can do in Motion that are faster and easier than trying to do the same things in After Effects or Nuke. Another advantage is that it is not a subscription based price and just a flat rate of 49.99, makes it a great solution or a whole new tool set for a price lower than many plug-ins for competing products. Check out my Free Motion classes on youtube. So here’s a collection of shortcuts (not all of them but the most useful ones I’ve found) I put together. To use these Make sure you go to your preferences in Motion and select the Standard Set. There is no link on the image for the cheat sheet. Have you tried clicking the image itself? Don’t know what to tell you- it’s been downloaded over 7000 times without issues. I tried with both Safari and Firefox. I am able to download your FCP Pro cheat sheet with no problem. Could you provide the link here? Nevermind, I was able to extract the link from the source code. I don’t know what the problem is for my browser. Hmm I’ll have to take another look- Im averaging 200 downloads a week according to my site stats. So Im assuming most of those 200 are getting the file.